It’s good to be the king, er, queen. In matriarchal hyena clans, being the alpha female promises your choice of mates, first dibs on food, and, as researchers found out recently, a more robust immune system. That last perk comes on top hyenas’ already hearty constitutions, which have helped spotted hyenas (Crocuta crocuta) survive everything from anthrax to years of living with an open wound. It appears that the hyenas are not necessary especially adept at healing as much as they’re able to prevent getting sick or infected in the first place due to carrying very high levels of antibodies, particularly in individuals at the top of the pecking order. Sometimes it is difficult to sort out the cause and effect of dynamic relationships like this, since it might seem logical that having a stronger immune response might help elevate an animal among its peers. 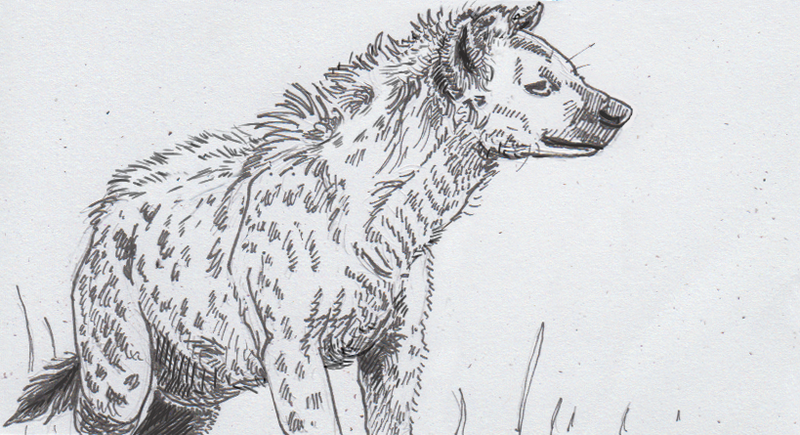 However, the nature of hyena hierarchies offer a variety of clues that help explain how being at the top is the source of alphas’ additional antibodies. While it probably does help to be a healthier animal if your dominance is challenged at some point, avoiding stress and disease in the first place is what’s keeping these animals in such good shape. An female hyena can only inherit clan leadership from her mother, and only if she is her mother’s youngest daughter. The only viable challengers are sisters from the same litter, meaning there’s a good chance that even smaller animals can ascend to power without needing to risk their life or limb in the process. Once in power, a female can’t really be challenged again, but she can make demands on the animals around her, including having as much as she wants of their meals. In this way, she can stay well fed without as much exposure to possible harm, saving her strength to more strongly fight off any pathogens that do come her way. On the opposite end of the spectrum, male hyenas, which are often adopted from other clans, sit at the bottom of the pecking order, and thus spend more of their energy healing up. Researchers are looking to apply some of this to human societies, which show some similar patterns. Wealthier people may have more access to care, but they also often live more protected lives as well, where their bodies aren’t facing as many stresses from poor hygiene or nutrition. We may have actually taken this concept so far it’s become broken though, at least according to the ‘Hygiene Hypothesis.’ Unlike an alpha hyena who still gets her paws a bit dirty living in the same environment as her clan, people may have inadvertently scrubbed too many potential pathogens our of our environment, depriving our immune system of the stimuli needed to produce antibodies. This would leave the most sheltered of us with less defenses for disease, and may also be tied to higher rates of allergies and asthma. Hyenas aren’t about to mirror humans by disinfecting their patch of savanna, but they’re still of great interest as models for future health studies. Aside from the dynamics they demonstrate as social animals with differing roles and ranks, they also live long enough to face some health problems you don’t naturally run into in other model organisms, like two-year-old mice. Right now, news that eating your fill before anyone else might not be applicable to most of humanity, but researches are still watching hyenas for other clues about how to avoid serious illness.